The Falcons get four touchdowns from Bryan Bafaro and advance to second round game with Sunset. The Liberty bell rang, and rang, and rang. In a game that seemed over in the first quarter, the Pacific Conference champion Liberty Falcons defeated Roosevelt, 65-26, in the first round of the OSAA state football playoffs in front of a packed house, Nov. 2, at Liberty High School. The Falcons scored five times in the first quarter, once in the second, and twice more in the third before their reserves came on to mop-up in the fourth quarter. "Our guys won this game during the week," said Liberty head coach Eric Mahlum. "They had a tremendous week of practice, and I think for the most part they played a complete game." Falcons quarterback, Brad Norman, agreed with his coach regarding the preparation, and added that the opponent didn't, nor does affect how the team approaches a game. "We practiced for these guys like we were playing a Clackamas or West Linn," Norman said. "We practice every week like we're playing a championship team. It paid off tonight and we're super happy to get the first Liberty playoff win in 6A history." Liberty wasted little time getting on the board, when after an AJ Records interception on Roosevelt's opening drive, the Falcons went 24 yards in three plays, capped by a Bryan Bafaro 10 yard touchdown run less than two minutes into the game. Following a successful two-point conversion attempt, Liberty led 8-0. The Roughriders fumbled on their next possession, again giving Liberty outstanding field position. The Falcons quickly capitalized, scoring in four plays, this time on an Aiden Maloney 16 yard scamper around the right side, putting the home team up 14-0 following a missed extra point. It didn't get any easier for Roosevelt from there, as Liberty scored on a Maloney 55-yard punt return for a touchdown three minutes later, then added a fourth first quarter score just more than two minutes after that when Bafaro hit pay dirt for the second time of the night, this time from 25 yards out to put the Falcons up 28-0. Roosevelt however, didn't quit. The visitors drove 59 yards in 10 plays on their next possession, getting their night's first score on a 3-yard touchdown run by quarterback Cabree Figueroa, cutting the Liberty lead to 28-7. Yet again the Falcons responded, this time in just two plays. Starting at their own 34 yard line, Norman zig zagged his way down the field on a 58 yard quarterback keeper to start the drive, then Bafaro — for the third time on the night — ended it, bowling his way in from seven yards out to make it a 35-7 game with just seconds left in the first quarter. But again the Roughriders responded, returning the ensuing kickoff 55 yards for a score to end the explosive opening stanza trailing Liberty 35-14. "The kickoff return was rough," said Mahlum. "You never want to help a team out, and that, plus more penalties than we'd like to see, really helped them." Things slowed down in the second quarter, with neither mounting much of a charge until Liberty's Marquis Brown made what was undoubtedly the play of the game. With the Falcons facing a fourth and long from Roosevelt's 31 yard line, Norman rolled to his right and lofted a ball towards the pylon in the front portion of the end zone. 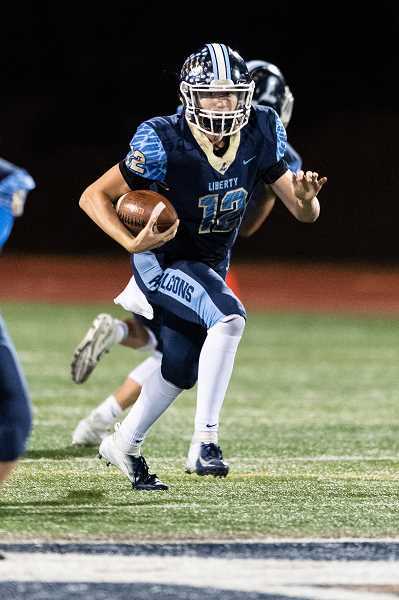 Brown, while tightly covered, leapt over the Roosevelt defender, tipped the ball into the air, then snatched it as he fell towards the ground, securing Liberty's sixth score and effectively icing what would become a blowout Falcons win. "We practiced that play all week, and waiting for that ball I just didn't want to drop it," said Brown. "I barely get the ball on offense, so when I do, I try to make the best of it. " "I love Marquisse out there," Norman added. "Honestly on that play I noticed he had a little bit of leverage, so I threw it up and let him do his thing. He's a great receiver and I trusted he'd come down with it." Bafaro added a fourth score in the third quarter and the Falcons' Jaxson Lake caught a 23 yard touchdown pass from Norman to make it 58-14 before Mahlum brought in the backups for the bulk of the final quarter. With the win, Liberty advanced to a second round game against the Metro League's Sunset Apollos. A team in which they lost to last season, 35-25. "It's definitely the next game up, but Sunset is an extremely good team that comes out of a strong Metro League and they're extremely well coached," said Mahlum. "We know their coaching staff very well and we look forward to the opportunity to go out and compete and play with them, and we'll be prepared to play." And what does Norman think about a second shot at the Apollos? He doesn't, because to he and his teammates, it's not about who they play, but rather just about another opportunity to go out there and measure themselves against the best the state has to offer. "It doesn't matter who we play," said the quarterback. "It's championship teams every week from here on out, so we're going to practice like we're playing the best of the best, and hopefully execute when we get a chance to play."